The Purge is a rather successful film franchise that has spawned four films. It centers around the premise that all crime is legal for one night a year. 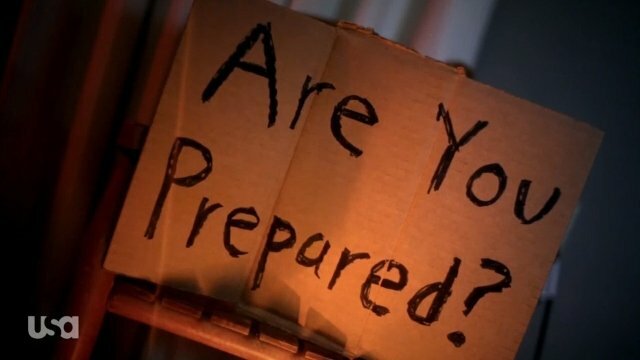 USA Network’s adaptation of The Purge premiered last night; so let’s find out what it has in store as we recap The Purge season 1 episode 1 ‘What Is America?’! Within a church, a group of people showered and got dressed for a ceremony. A woman named Penelope sent a letter to her brother, Miguel. She told him that she is following in their parent’s footsteps. Miguel went to Kantrow Rehabilitation Facility, a drug rehab center, to visit his sister. He learned that she had left the facility a few months earlier. The woman running the facility let Miguel know that Penelope left with a man named Henry. 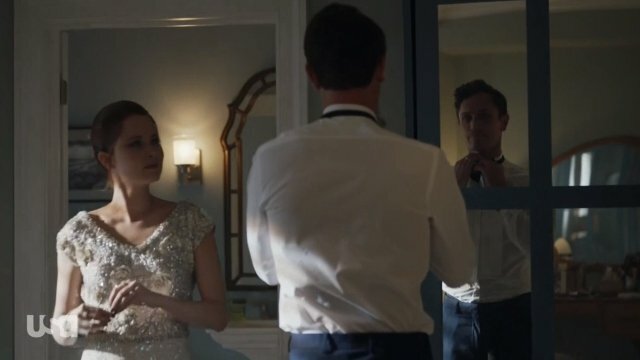 Ben and his wife were getting dressed for a party being held to celebrate the Purge. A newscast informs us that weaponry has been sold in record numbers and this Purge is expected to be the largest in history. A woman named Jane walked into work and went up to her office. She was informed that only the floor she is working on will be secured during the Purge. Penelope joined a group of women, who have vowed to take revenge on all who have wronged them. The group boarded a bus and set off for town. Ben and his wife left their home, they talked with their cab driver. We also learned that the party they were going to was a business deal to secure funding for a housing project. The bus continued on its journey and Penelope comforted a fellow passenger. Ben arrived at the party and his wife sent him off to find their host, Stanton. Miguel went to confront Henry, and he quickly got into a fight with some of Henry’s friends and beat them up. Jane received a message that someone had arrived at her office looking for her. She left her secure floor to go and meet with them. Jane was told that the meeting can’t begin until the Purge starts. Ben’s wife, Jenna, asked a server at the party for a painkiller. She then explored the Stanton house and found some childhood photos before dreaming about having a child. Miguel found the building where Penelope’s group had holed up. The group informed him that Penelope was willing going to let people attack her in order to help them release their anger. The party at the Stanton residence began as the house was locked down and masks were handed out. The party’s theme this year was serial killers, so all of the masks were faces of famous serial killers. The sirens went off and the Purge commenced. Jane gave the person a large sum of money and was told to follow her progress on an app. Presumably, Jane has hired a contract killer to execute someone for her. One member of the group, Arthur, stepped off the bus and was promptly executed by a set of Purgers. 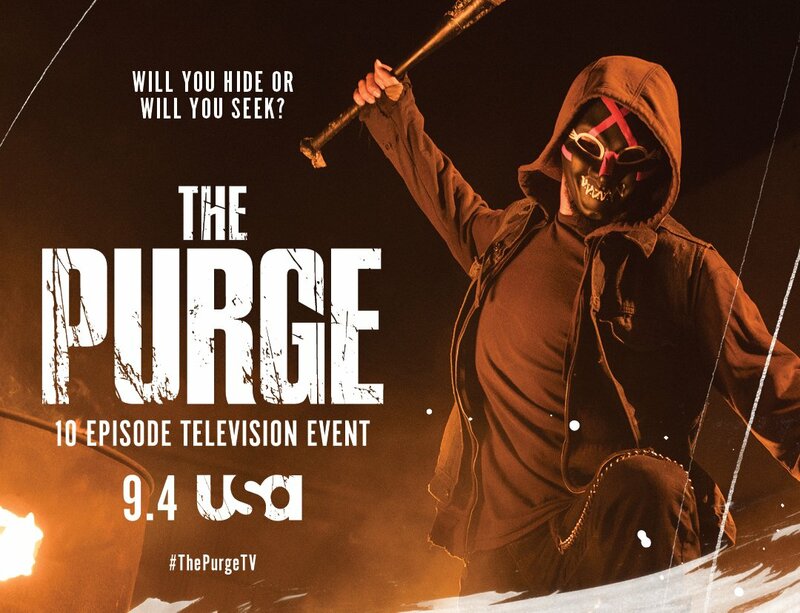 What did you think of The Purge season 1 episode 1? Let us know in the comment section! The post The Purge Season 1 Episode 1 Recap appeared first on ComingSoon.net.